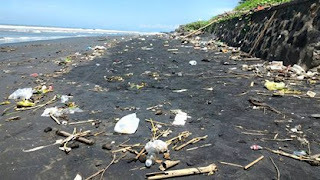 Kuta Beach, Seminyak Beach, Canggu Beach, Legian Beach, and several other famous beaches in Bali is a gathering place for the garbage during the rainy season. The garbage on the beach are a common sight in Bali. 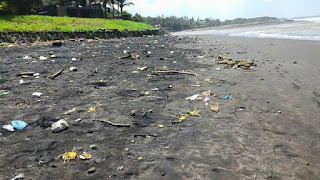 There are still many beaches in Bali has continuously accumulate garbage and more. Although at several beaches in the area have had a clean beach, but during the rainy season bins will adorn many beaches in places famous tourist destinations, such as Kuta, Legian, Seminyak, even in the beach area of Nusa Dua. Trash on the beach came from the river brought by the floods. 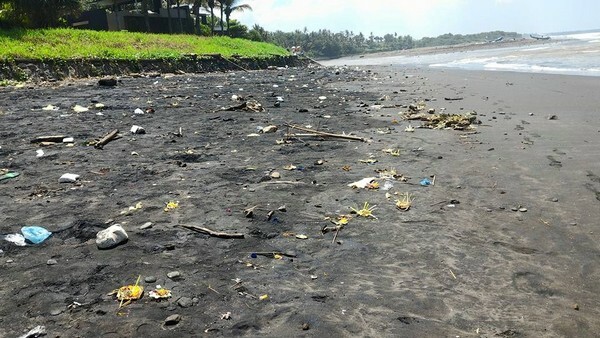 West Bali region, trash on the beach come from homes of people living along the coast. The fishermen who live along the coast are less concerned with cleanliness. That keep the beaches are kept clean to provide a better atmosphere and beautiful. Most of the fishermen living in poverty. So less attention to hygiene problems. Throwing rubbish around the beach which becomes a habit. Though landfills can be made easily behind the house, or with burn all garbage owned. Not only from the communities living close to the beach, trash on the beach is also derived from the rituals performed at the beach. As in the coastal region around Pura Goa Lawah, ritual activities at the beach almost every day carried out at the venue. Ritual ceremony means submerge into the sea is something that is often done. So a lot of the remnants of ritual activities that will be stacked on the shore and a sight is not good. Every year when the rains come, along the southern coast of Bali as Seminyak, Kuta, Uluwatu always crowded with trash floating in the ocean, scattered on the beach, making anyone who would be disgusted to see garbage in tourist attractions. Trash can undo the tourists to relax on the beach may intend to surfing or just sun bathing on the beach, but canceled because of the problem of garbage strewn on the beach. Trash is not something that is desirable for the island paradise known as a tourist destination. There must be strong action and awareness of the whole society to be able to deal with this problem. Plastic waste is the biggest problem in Bali. Plastic Trash clogs waterways. A study which said Indonesia is the second largest marine polluters in the world after China. The rapid growth of plastic waste globally threatened marine life and death variety of sea life. Local authorities should be committed to policies related to plastic waste. Suppose that by educating the public with regulations to reduce the use of plastic, promoted a trash in its place. We all know that it is very difficult to find trash in the area around the beach. It really must be considered. Local authorities should put bins in every corner of the coastal areas, especially places that are crowded by people, so that they are not difficult to dispose of waste.